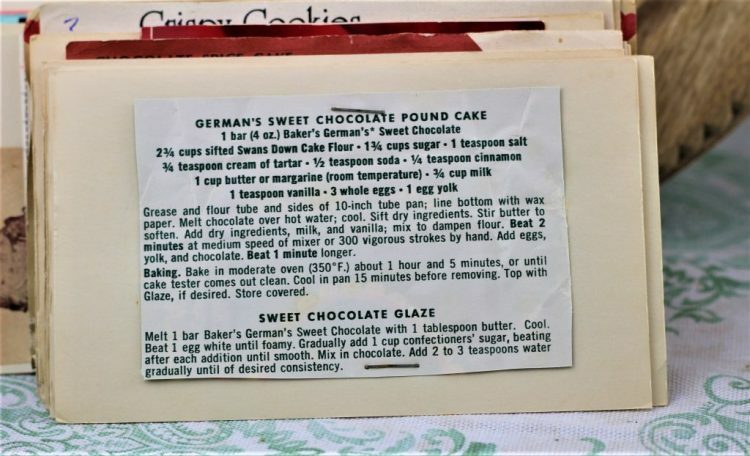 Front of the recipe card for Germans Sweet Chocolate Pound Cake. 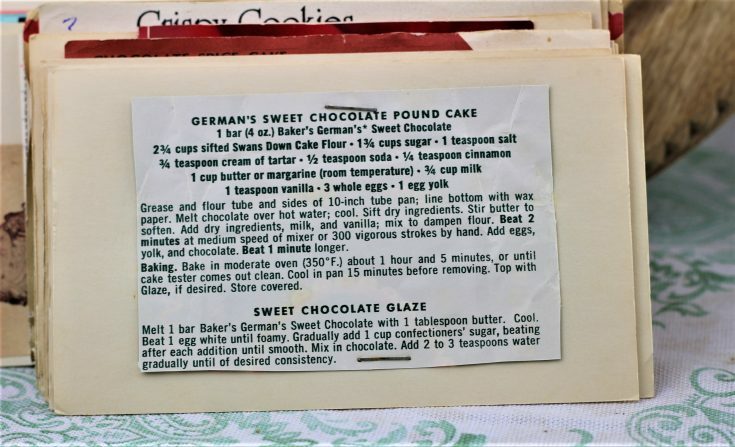 There are lots of fun recipes to read in the box this recipe for Germans Sweet Chocolate Pound Cake was with. Use the links below to view other recipes similar to this Germans Sweet Chocolate Pound Cake recipe. 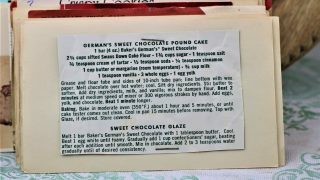 If you make this Germans Sweet Chocolate Pound Cake recipe, please share your photos and comments below! Grease and flour tube and sides of 10-inch tube pan; line bottom with wax paper. Melt chocolate over hot water; cool. Add dry ingredients, milk, and vanilla; mix to dampen flour. Beat 2 minutes at medium speed of mixer or 300 vigorous strokes by hand. Add eggs, yolk, and chocolate. Baking. Bake in moderate oven to (350°F.) about 1 hour and 5 minutes, or until cake tester comes out clean. Cool in pan 15 minutes before removing. Top with Glaze, if desired. Store covered. Melt 1 bar Baker's German's Sweet Chocolate with 1 tablespoon butter. Cool. Beat 1 egg white until foamy. Gradually add 1 cup confectioners' sugar, beating after each addition until smooth. Add 2 to 3 teaspoons water gradually until of desired consistency.